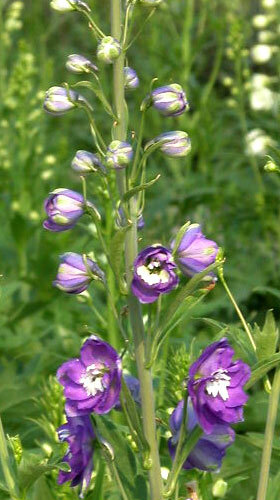 A perennial (Zones 3 to 7) that flowers in the first season when planted from seed. Sow seed in 72- to 144-cell trays with seed covered. Emerges in 12 to 18 days. When sown in early March, can be transplanted in mid-May to the tunnel. Plants transplanted to the tunnel in mid-May can be harvested in early July. Plants produce 2 to 3 usable stems in the first year, but should be earlier and more productive in the second year. Root disease (Sclerotium rolfsii?) devastated plant populations in Cornell open field plantings, and less so in the tunnel. Sowing in late summer for earlier cropping the following year is another option. There are a number of D. elatum hybrids with erect spikes of large florets that make a spectacular show in the vase. Aurora, Guardian and Candle series offer white, blue, purple and lavender shades, with stem lengths of 22 to 30 in. Belladonna hybrids such as Bellamosum, Belladonna Clivenden Beauty, Oriental Blue have a more open raceme with branching, shorter stems, but longer plant life. 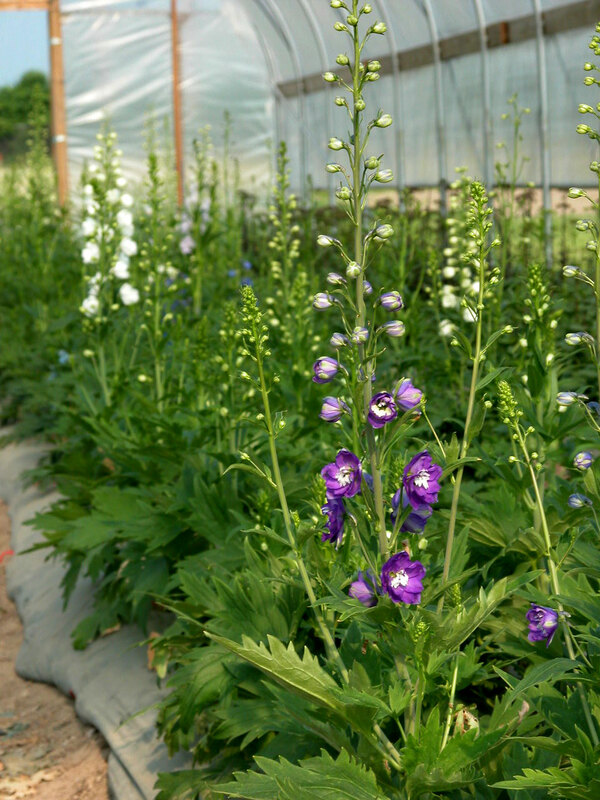 Delphinium is very sensitive to ethylene, and must be stored away from ethylene-producing produce. Vase life of D. elatum hybrids is 5 to 7 days, for Belladonna hybrids only about 4 days, with flower life ended with petal loss.